I find I’m pulled in two different directions when it comes to dressmaking. Part of me wants to have a fabulous high quality wardrobe full of items with linings, pockets and fancy finishes that you just don’t find in ready made clothes – even the expensive ones. Another part of me wants to be the sort of person who can look at a bolt of cotton and be wearing a thrown together outfit the next day. At the moment I seem to have lots of “nearly finished” knitting and sewing projects so if I was going to start something new I thought it had better be something quick and easy, something from the second category. I started cutting out the pattern, view C with pockets, at 9:50am. Half an hour later I had my paper pattern pieces. Then I attacked the fabric and it took another hour just to get the fabric pieces cut out. I stopped for a coffee before spending another 15 minutes or so cutting out and attaching the iron on interfacing. So far this feels like much the same time I would have spent on a normal non-1 hour pattern. Finally I get to the sewing machine, just before midday. I made one small mistake that required a bit of seam ripping. I stopped for a lunch break but only for twenty minutes or so. 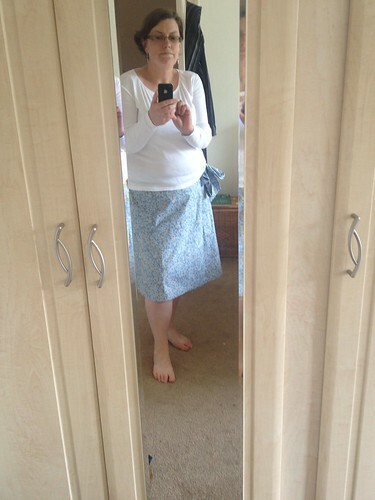 I finally had the skirt ready to wear at about quarter past three. So a total of three hours sewing time, not one. That’s before you count the hour and a half of cutting to begin with. Apart from not having a zip to insert I can’t really see why this is supposed to be a super simple pattern, I’m not really sure where I could have gone faster. I could certainly make another skirt from the same pattern a little more speedily now I’ve understood all the instructions but not that much faster. Being a wrap skirt there are long ties and acres of waistband to contend with as well as buttonholes to make and buttons to sew on. I do like the finished item, it doesn’t feel especially cheap & quick. (Darren did comment maybe they meant the skirt would only last an hour…) I’d make it again in a slightly heavier fabric such as a quilting cotton to be less flyaway. I’ll have to time myself making a ‘normal’ skirt to figure out whether that is indeed much slower or whether I’m just a super slow seamstress!